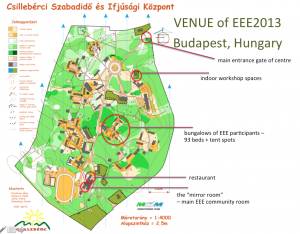 The venue for EEE2013 will be a Youth and Leisure Center in Budapest’s forests. The 46 acres of forestland provides a lot of space for outdoor workshops – we share the space with some wild boars too. The city center is easily accessible by public transport or by car, and in a short walking distance you will access the best view to the capital of Hungary. Just in the neighborhood there is a commercial high ropes course and the Pioneer movement’s train station: this tiny train has a long history back into the roots of the communistic Hungary. You can enjoy a 45 minutes trip into the forests of the Buda side. From our campus you can also do some longer hikes into the forest and hills or have your daily run. The former Center for Pioneers provides a special opportunity to travel back in time. It provides all expected comforts for an experiential conference, but You will meet installations from the 80′ of even earlier. We think this provides a more realistic impression from the Hungary of Today too. All in all – this venue provides all the needed framing for a wonderful conference – even better if we consider the fact WE ALL put the content into it!